If you want a laptop powerful enough to do just about anything on, then both Apple and Microsoft have you covered. Apple just refreshed almost its entire line of MacBook Pros, whereas Microsoft has been selling the Surface Book 2 since its launch at the end of 2017. The question we're concerned with here is: how do they stack up against each other? And which one should you be spending your money on (if you're not flush enough to afford both)? We've compared the two power laptops in all the key categories for you below. One of the major differences between the Surface Book 2 and the MacBook Pro is that the Microsoft laptop has a touchscreen that completely detaches. You can, if you want, use this device as a Windows tablet as well, or with a stylus (bought separately), and that immediately gives you a whole host of different options. That distinction affects the design too: primarily the eye-catching fulcrum hinge that handles the screen and keyboard connection. Otherwise this is an excellently turned out laptop, all brushed aluminium and elegant lines. You get a choice of a 13.5-inch, 3000 x 2000 pixel display or a 15-inch, 3240 x 2160 pixel display, with associated differences in size and weight too. The MacBook Pro 2018 is another stylishly designed laptop, perhaps the best-looking computer Apple has ever put out, even if the look hasn't changed much for a couple of years now. The unibody aluminium shell really stands out, whether you go for the space grey or silver options, and while the low-travel butterfly switches on the keyboard are an acquired taste, Apple does now seem to have fixed the problem of sticking keys. The MacBook Pro may not have a touchscreen, but it does have a Touch Bar (featuring app shortcuts and Touch ID) on all but the most basic 13.3-inch model. Various configurations are available with either a 13.3-inch, 2560 x 1600 pixel screen or a 15.4-inch, 2880 x 1800 pixel screen. Again, that choice affects the size and weight of the laptop you end up with. As we've said, these powerhouse laptops come with a variety of configuration options. The MacBook Pro starts off with a 13.3-inch model that gives you a 7th-generation 2.3Ghz dual-core Intel Core i5 processor, 8GB of RAM, and 128GB of storage space. At this size of display, you can ramp that all the way up to an 8th-generation 2.7GHz quad-core Intel i7 processor, 16GB of RAM, and a huge 2TB SSD, with various steps in between. Opt for the larger, more expensive 15.4-inch models, and the spec starts with an 8th-generation 2.2Ghz hex-core Intel Core i7 processor, accompanied by 16GB of RAM and a 256GB SSD drive. At the maxed out model, there's a 2.9Ghz hex-core Intel Core 90 processor, 32GB of RAM, and up to a whopping 4TB of storage. Unlike the 13.3-inch models, you can get a discrete graphics chipset installed, up to a Radeon Pro 560X. That all adds up to a beast of a machine, and you'll pay for it too. Over in the Microsoft corner, the specs are similarly high level. The 13.5-inch model starts with a 7th-generation 2.5Ghz dual-core Intel Core i5 CPU, 8GB of RAM, and 256GB of storage. If you really want to go to town, you can get an 8th-generation 1.9GHz quad-core Intel Core i7 processor, 16GB of RAM, and up to 1TB of internal storage. If you want the 15-inch Surface Book 2, specs start with that 8th-generation 1.9GHz quad-core Intel Core i7 processor, 16GB of RAM, and 256GB of storage. You can only upgrade the storage and graphics from there – the storage up to 1TB, and the graphics from an integrated Intel option to an Nvidia GeForce GTX 1060. The Surface Book 2 doesn't offer quite the same specs at the highest level as the MacBook Pro, but it can still cope with everything you throw at it and then some. 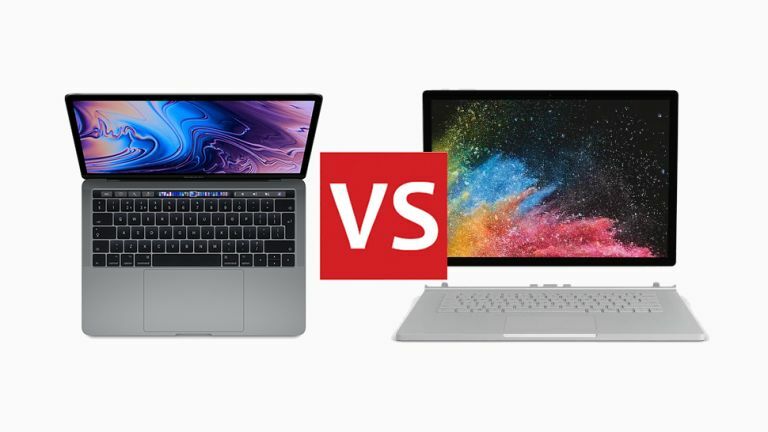 If you are choosing between these two laptops right now, perhaps the biggest difference is on the software side – one runs Windows, the other macOS. Both have developed into excellent operating systems, and which one you prefer will probably depend on which one you're most used to. Bear in mind that your computer has to work with everything else in your home, and so if you're heavily into Apple gear, a MacBook Pro is much more sensible. We've already mentioned the detachable screen of the Surface Book 2, and after several missteps, Windows 10 now works perfectly fine on a tablet. It's a full OS that you can take anywhere and do anything on, from Photoshop to iTunes to a full desktop web browser. The MacBook Pro has the same big applications and full desktop web support, of course, but the keyboard is always attached. Depending on your choice of model, the MacBook Pro comes with two or four Thunderbolt 3 ports that are also compatible with USB-C standards. The Surface Book 2, on the other hand, features two full-sized USB ports, one USB-C port, and a memory card reader, so you may have to use fewer dongles as you attach peripherals. Both laptops retain the traditional 3.5mm audio jack. In terms of battery life, the MacBook Pro claims around 10 hours of iTunes video playback, which sounds about right. The Surface Book 2, Microsoft says, will last for 17 hours of playback – you might not get quite that much, but in our testing it did last an impressive amount of time between charges (around seven hours of mixed use). Trying to pick a winner here seems a little unfair, as it gives the impression that one of these is a bad laptop or unworthy of your attention – these really are two of the best laptops on the market now, and on one level picking between them could be as easy as deciding whether you prefer Windows or macOS. The MacBook Pros, living up to their name, can certainly be tricked out with more powerful components (with a price to match). Unless you're chewing through a lot of video encoding though, you're not really going to need that much power – and if you're buying a new computer for gaming then Windows is always going to be a better choice. In terms of design and build quality on these two computers it's pretty much honours even, and the Apple and Microsoft engineers can give themselves a collective pat on the back for what they've managed to achieve here. It's hard to see how these laptops could do better in terms of aesthetics, but we're sure we'll find out at the next refresh. It's probably worth settling on the configuration you think you need and checking how prices match across the board if you're trying to weigh up the Surface Book 2 and the 2018 MacBook Pros. We're positive you'll be impressed whichever one you go for; but for us the extra flexibility of the Surface Book 2, and the broader compatibility with other gear (like Android phones) just edges it.